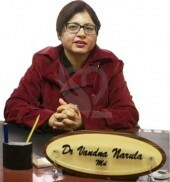 Dr. Vandna K Narula, M.B.B.S, M.D (Obs & Gynae) is In-charge of Infertility and IVF Centre at Cosmo Hospital, Mohali. Dr. Narula is well aware of today's altering & challenging fertility issues having done advanced infertility training from the prestigious Sir, Ganga Ram Hospital, New Delhi after her post graduation, MD (Obstetrics & Gyanecology). She has an excellent surgical hand for fertility related Laparoscopic and Hysteroscopic procedures like ovarian cyst, fibroids, tubal blockage, polyps, septum etc. She has conducted numerous Infertility and IVF cases successfully, howsoever complicated it may be. Complicated Delivery cases with high BP, diabetes, thyroid, fibroids and other complications. Dr Vandna is a keen academician and has presented several papers at various National & International Conferences. She is also present at most leading academic conferences to keep herself updated on the latest technologies & techniques in the field of IVF & Artificial Reproductive Techniques (ART).